Last fall I watched a Disney TV movie called “The Swap” and thought, Wow, I wish I could read that as a book. Turns out it was based on a book! (Also, have I mentioned before how it’s my dream to have one of my books made into a Disney TV movie? Because, honestly, that’s the type of book I write.) 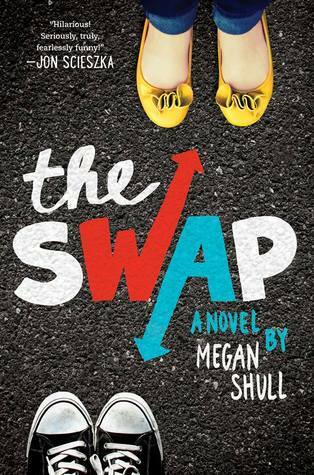 Anyway, when I spotted Megan Shull’s THE SWAP at the Scholastic Warehouse Sale, I immediately threw it in my shopping cart. (Yes, a literal shopping cart.) Interestingly, the movie was aged up from middle school to high school, but I can understand why. The story is completely appropriate for middle grade readers, BUT it is not a book I’d recommend to younger kids reading up due to some of the gender-swapping content. For example, my six and eight-year-old kids watched the movie and thought it was hilarious, but my son would be freaked out reading about the boy in the girl’s body learning about a girl getting her period for the first time. Yeah. Not ready for that talk. Moving on. Here’s the description for the book. ELLIE spent the summer before seventh grade getting dropped by her best friend since forever. JACK spent it training in “The Cage” with his tough-as-nails brothers and hard-to-please dad. By the time middle school starts, they’re both ready for a change. And just as Jack’s thinking girls have it so easy, Ellie’s wishing she could be anyone but herself. Then, BAM! They swap lives – and bodies! Now Jack’s fending off mean girls at sleepover parties, while Ellie’s reigning as The Prince of Thatcher Middle School. As their crazy weekend races on – and their feeling for each other grow – Ellie and Jack begin to wonder if maybe the best way to learn how to be yourself is to spend a little time being somebody else. 1. The premise – I already had a thousand scenarios of how this premise would play out in a book after I watched the movie, and it was different in the book. References to puberty aside–and really, how could that be avoided?–it’s all handled very tastefully and hilariously. 2. The voices – I have to be honest here. Half the time, I had no idea what Jack’s brothers were saying. They have their own language, but I applaud Ms. Shull. I think she actually exaggerated it for the purpose of showing how different the two characters are, but it works. 3. The character arcs – It’s hinted at in the description, so I’m not giving anything away by saying that Ellie and Jack discover themselves by being someone else. I love how they learn more about who they are inside while they’re taking a break from being themselves on the outside. It’s rare to get a glimpse of how others see you, but that’s what the magic of this story allows. 4. Ellie & Jack’s relationship – Not only do they get to know themselves, but they also get to know each other, since they’re living each others’ lives for a weekend. It was fun to watch how close they become, and how they can use that knowledge to help each other. 5. The humor – I tried to find a good example to post, but they’re all too long. Mostly the humor is situational and related to Ellie or Jack being completely confused about what’s going on in the other’s life and having to wing it. I was laughing out loud through much of the book. I highly recommend this one, but as I said, if you have a younger MG reader, be aware there is talk of bodily functions related to puberty–for both boys and girls–in case you haven’t had those discussions yet. A couple of weeks ago, in preparation for “The Mortal Instruments: City of Bones” movie, I read CITY OF BONES. I loved it and couldn’t wait to get CITY OF ASHES. I’m still waiting on CITY OF GLASS, but the fact that I’ve only read the first two is an important point in this post. Anyway, because I loved the books, I went into the movie expecting to like it. And I did, even though it was quite different from the book. But I’m ok with that. Movies are a different medium. You’re experiencing the story in an entirely different way–watching the characters go through the plot rather than going through it inside their heads. So here are a few things I think affected the way this particular movie was adapted, with some general thoughts on adaptations as well. If I hadn’t already read the second book in this series, I would have thought the writers had taken a lot more leeway with the story than they actually did. In order to explain the world, the writers revealed a number of plot points in the “City of Bones” movie that don’t happen until at least CITY OF ASHES. Even without having read CITY OF GLASS, it was clear to me from where things were going at the end of CITY OF ASHES that some of the things revealed from the very beginning of this movie are actually things you find out in CITY OF GLASS. Sorry if that sounds vague, but I’m trying not to include any spoilers. In any case, I can understand why they did it this way. When you’re reading the story, you want that tension to get to the end, but in a movie where the viewer hasn’t been gently grounded in the world, it could just end up a confusing mess. Did the writers have to do it the exact way they did in the movie? I don’t know. They might have been able to come up with a way to avoid spoiling a couple of those plot points, but maybe not. It will be interesting to see how they handle those things if they move forward with adaptations of the later books. As an avid reader, I’m willing to sit through a four and a half hour miniseries (PRIDE AND PREJUDICE) or a two-part movie (BREAKING DAWN, HARRY POTTER AND THE DEATHLY HALLOWS) for a book I really love. But for a book I probably wouldn’t read? Like THE HOBBIT? (Sorry, just not my taste). Nope. I’ll go for the only slightly long version, like “The Lord of the Rings” non-extended version, but I’m not going to sit through something I anticipate being too convoluted for a movie. Even if it’s not true, I expect it to be slow-paced and possibly boring. So, that’s the dilemma film-makers have when they decide to adapt a book. There’s no way they can include the whole story, so they cut scenes and plot points and condense it down to what they anticipate viewers will connect with best. I understand that, and I don’t mind that they had to cut quite a few non-action scenes to make this movie work. There’s a lot of scrutiny on YA books made into movies, particularly because TWILIGHT and HARRY POTTER and HUNGER GAMES were so successful. Not every book adaptation is going to bring in those numbers, but the comparisons will still be made. I could definitely see the effect budget had on this adaptation. Cassandra Clare created numerous creatures you’ve never heard of before. While there were some great special effects in this movie, there definitely was room for more with the demons. They chose to simplify in that area, and since the box office numbers didn’t reach the TWILIGHT levels (which, let’s face it, would have been unrealistic to expect), I think it was a wise decision. Who knows? If the numbers improve, they might do more with book two. How the characters will translate to the big screen is probably what I’m most anxious about when I go see a movie adapted from a book. If I love a book, it’s because I care about the characters, and I want to love them on the screen, too. For the most part, it’s about the way they act rather than appearance. Sure, I want them to look the way I pictured them, but the only way the actor’s appearance is going to really bother me is if some physical characteristic that’s intrinsic is off–for example, the MC is touchy about being short but the actress is 6 feet tall. That’s a lame example, but hopefully you get the idea. The thing is, that character doesn’t exist in real life, so there’s never going to be an actor who fits exactly. In “The Mortal Instruments,” I was fine with all of the main characters. The only one who stood out as being very different from what I expected was the antagonist, Valentine, who didn’t look or act the way he’s portrayed in the books. But even here, I can understand why they went for the more flashy/unhinged bad guy. It certainly plays better in a movie. I’m sure there are other things I could point out, but these are the points that stuck out to me most. What are your favorite movie adaptations? Or least favorite? What did you think of this one? My husband and I decided to do a “Pirates of the Caribbean” marathon this week, which is appropriate since we just returned from the Caribbean. As you can see, our ship was a little bigger than the Black Pearl. 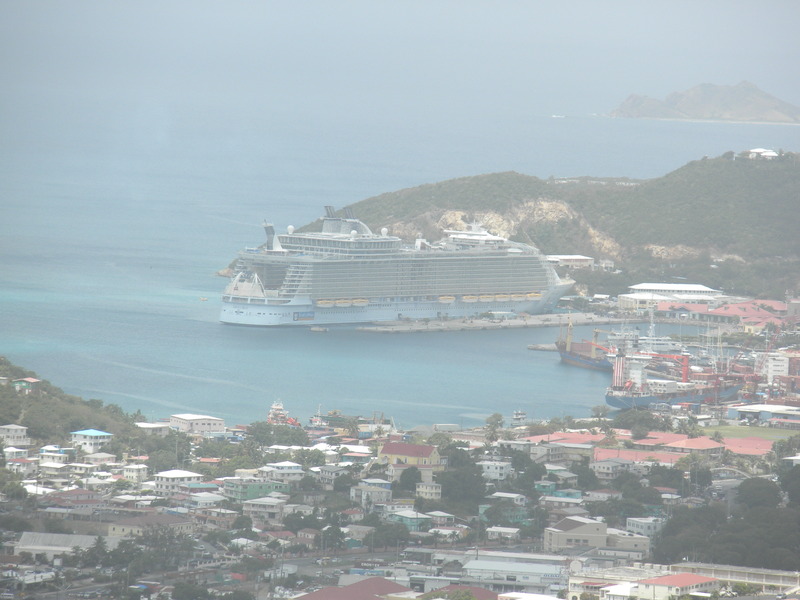 This view is from an outlook on St. Thomas. As we were watching the movies, I had several thoughts about things that worked really well and could be applied to writing. For the purposes of this post, I’m focusing on the first three movies, as the last one stands alone in many ways. It’s all in the execution. Most people out there agree that Johnny Depp stole the show as Captain Jack Sparrow. He took the character and turned him into an icon. He’s so identified with Pirates of the Caribbean that they added his face to the Disney World ride that inspired the movies. Would another actor have had the same impact? Certainly not in the same way. It’s something important to remember as writers. It’s more than the idea–it’s how we execute it. No one else can write the same story we can, just as no one else would have been the same Jack Sparrow. It’s all in the details. While the focus is of course on the main characters, there are all these little details that recur in the movies. The dog with the key–who comes from the ride–is in the first three movies (the jail, the island with the cannibals, and the Brethren Court). Jack’s hat and compass also get time in the spotlight. Then there’s the sword that Will made. It almost becomes a character, starting with Will presenting it to Gov. Swan. In each movie, we’re reminded about the sword, until Davy Jones uses it to fatally impale Will. Details are important. If you plant something in your story, make sure it has a purpose. And if it’s something vital, remind the reader about it so that it doesn’t come as a surprise when its big moment comes. If the sword hadn’t been highlighted in each movie, its significance would have been lost in the climax. It’s all in the characters. From the moment we see Elizabeth protect Will as a child, we care about the characters. We expect to see that bond grow, and we hate all the circumstances that keep them apart, even in the end. Then there’s Jack. What a fascinating character study. Is he good or bad? He’s never totally bad–he doesn’t kill like the other pirates, but he’s never totally good either–his schemes always have his ultimate interests in mind. But then, in the third movie, he does something selfless. He’s the kind of guy you’re interested in watching but wouldn’t necessarily want as a friend because he’d probably double-cross you. He was intriguing enough he got his own movie once the first story ended, so that says it all. It’s all in the strategy. If you’re interested in writing a series, you can learn a lot from these movies. The first movie stands alone. It wraps everything up nicely. If they’d never made another movie, you wouldn’t feel cheated. That’s exactly how you should approach a series as an unpublished writer. Even if you see possibilities for a series, the first book has to be a complete story. Publishers are less likely to take a chance on a new author if they have to buy in to multiple books as part of the initial deal. Once your audience is hooked, you can use those cliffhanger endings. The second and third Pirates movies are so wrapped up in each other you want to watch the third one right away. I’d classify the fourth movie as a spin-off. The initial story was complete, but fans still wanted more. It worked because viewers loved the world so much. Will there be more movies? I did a quick search online, and it’s a possibility. The lesson for us, then, is to create characters that readers don’t want to let go. Anyone else have other thoughts on these movies or others that have taught you a lesson? Yesterday was my ninth wedding anniversary, so my husband and I took the day off. We made it a movie day, with SNOW WHITE AND THE HUNTSMAN in the morning and MEN IN BLACK 3 in the afternoon. We thoroughly enjoyed MIB 3. From the moment the credits came up with the same funky font used in the first movie, it was exactly what we expected. It lived up to MIB (let’s not go into MIB 2), and we’ll definitely add it to our collection. I’m not so sure about SNOW WHITE AND THE HUNTSMAN. If you haven’t seen the movie and intend to do so, stop reading now because this post has spoilers. 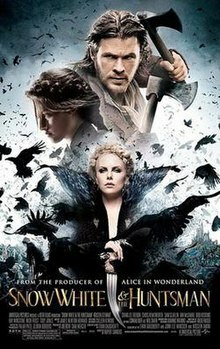 SNOW WHITE AND THE HUNTSMAN had something entirely different to live up to than a previous movie–a fairy tale that was immortalized first by the Brothers Grimm and then Disney. I’m not intimately familiar with either version, but I know them both enough to expect her to get her prince in the end. But let me back up. I liked many things about the movie–the cinematography, the action, Charlize Theron’s chilling performance. I even like Kristen Stewart. But I expected there to be a love story, and I didn’t buy the one the movie seemed to be selling. I say “seemed” because it was never resolved. At the beginning, the movie clearly sets up William as Snow White’s prince. They’re best friends with a truly deep connection. When Ravenna’s army attacks, William’s father has to tear him away from her. Later, when William’s father finds out Snow White is still alive, his simple question about where his son is makes it clear that William continues to carry a torch for her, even believing her dead. The movie cuts to a scene of his heroics and I thought, yes, this is her prince. Who cares that the huntsman is in the title? Snow White and William are meant to be together. Then there’s the huntsman. He’s a drunk widower sent to retrieve her for the queen. When he discovers the queen can’t deliver on her promise to bring his wife back from the dead, he decides to help Snow White instead. When that happened, I leaned over to my husband and said, “I hope they’re not going to put those two together.” He replied, “No, he’s too hung up on his dead wife.” I wish they’d left it at that. The huntsman (I don’t even remember his name) leaves Snow White with some women, but when Finn, Ravenna’s brother, attacks–with William pretending to be one of them–he finds her just after she has a moment staring at William across the fire. They meet the dwarfs, and after a night of revelry, Finn’s men find them again. This time, William reveals himself, killing off the other men while the huntsman takes on Finn. I expected there to be a bigger reunion with William–at least a hug–but the focus turns to the dwarf who jumped in front of Snow White to save her. The group travels on together, with Snow White shown between the two men. Then there’s a scene in the snow with just Snow White and William, and I thought, finally we get the reunion scene. They talk about old times, and then there’s a kiss. But. It turns out it’s really the queen in disguise, and she gives Snow White the poisoned apple. When William kisses her, nothing happens. That’s when I knew this story was going somewhere I didn’t want it to go. They take Snow White back to William’s father’s castle and lay her out as though dead. The huntsman comes in, says her spirit reminds him of his wife, and kisses her. He walks away and doesn’t see her wake up. Cut to William arguing with his father about carrying on Snow White’s legacy. Even here, I still love this guy. When Snow White strides into the crowd with renewed purpose, she goes straight to William and takes his hand. She doesn’t even look for the huntsman, and it’s never clear if she knows he’s the one who woke her up. They go into battle with William and the huntsman on either side of Snow White. She defeats Ravenna, and the final scene is her being crowned queen. William and his father stand off to the side, along with the water women, and you even see one of the girls whose youth Ravenna drained back to her normal self (I’ll come back to that). Snow White stares at the doors in the back, and I kept wondering what she was waiting for. Then the huntsman steps out and smiles at her from the back of the room. That’s it. The movie’s over. What?? I really wanted something more here. I think what the filmmakers were going for was more of an empowerment story. Snow White doesn’t need a prince. Ok, but if that’s the case, why did they go to so much trouble to set up two potential men for her? And if the look at the end is supposed to imply that she loves the huntsman, I don’t buy it. That kiss she gave William was real. There was no attitude toward the huntsman that made me think she loved him, more that she came to appreciate him or value him as a friend. Then there’s the girl going back to normal. If that was the case, where were all the other girls Ravenna drained over the years, including the huntsman’s wife? The interchange between the huntsman and Finn made it clear that’s what happened to her, and based on this other girl, the process didn’t actually kill her. So what really happened to the huntsman’s wife? After discussing our frustration with the ending, my husband and I decided that maybe the huntsman’s wife was standing behind him in the back and they just didn’t show her. It’s not like Snow White could end up with him anyway. And I wouldn’t want her to. I still think William’s her prince. Oh well, I saw somewhere that they’re thinking about a sequel, so maybe I’ll still get the resolution I want. I think that’s what it comes down to. I felt cheated out of a solid ending. The story left me hanging, and if I don’t know another one’s coming, that frustrates me. It’s something to remember as I’m writing. Don’t leave readers hanging. It will only leave them unsatisfied and maybe a little angry. Anyone else have thoughts on this movie? What other movies have left you feeling cheated at the end?